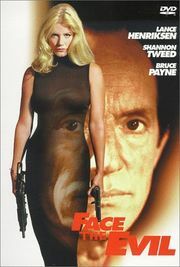 (AKA Face the Evil) 1997, Starring Lance Henriksen, Shannon Tweed, Bruce Payne, Jayne Heitmeyer. Directed by Paul Lynch. As even a casual glance at his resume shows, Paul Lynch has never been a director to shy away from the latest cinematic bandwagon. From slasher horror to sensitive teen drama to sci-fi television shows, he's been there for almost thirty years, and almost always in Canada. In 1995, Lynch directed No Contest for Norstar Entertainment. One of about five Canadian production companies still making low-budget genre films, Norstar releases many of the movies found on the bottom shelves at Blockbuster and on late night cable TV. The first No Contest brought together Andrew Dice Clay and Shannon Tweed in a kickboxing battle over a beauty pageant. It might not seem like the type of film which demanded (or even deserved) a sequel, but the straight to video market is weird and wonderful place. Virtually un-rentable titles like Bloodfist VII and Hellraiser VI seem to make no logical sense in the scheme of the universe, but there they are collecting dust in the " New Releases" section anyways. No Contest II picks up where the last one left off. Actually, it doesn't, since it's more than likely that you never saw the first movie, but the set-up is pretty much the same. In the first film, b-action movie star Sharon Bell (Tweed) thwarted the baddies because she just happened to be a real-life kickboxer. This time she's a talented martial arts expert starring in the kind of "action-packed" TV show Canadian networks show on dreary Saturday afternoons to satisfy Can-con requirements. Her co-star is a spoiled young actor named Steven Ivory. One fateful day, Sharon decides to visit her estranged younger sister Bobbi, who works at the Holman Gallery, an upscale art museum. Also arriving that day is a rare work of art, a sculpture that art patron Eric Dengler (Lance Henriksen) has imported from Europe. But there's trouble at the loading dock-- two of the security guards are more crooked than a tax shelter film producer, and just as the gallery is about to close, they let in Beagle, Reggie and Lisette, three armed hoods. Out in front, Steven Ivory and Jack, the TV director, size up the gallery as a location for an upcoming episode (Say, don't they have location scouts for that sort of thing?). Just as they slip inside, the museum officially closes, and the main computer seals off the all the doors. Sharon greets them, but Bobbi tells them they have to leave. Since the security system can only be bypassed with an ID card, Sharon decides to run up to Bobbi's office and grab one. While they are waiting, Bobbi, Steven, Jack and Dengler, who has arrived for the unveiling, take a brief tour through an incredibly bad video art exhibit led by Mrs Holman herself. Suddenly, Steven catches a glimpse of Reggie in a Joker-inspired crime spree--he's running through the art museum defacing paintings with a can of spray paint. Steven takes off after him, and the others go to the lobby to try and get some help. That's when the thugs strike, and Dengler takes control of the situation, revealing himself as the mastermind behind the plot. He shoots Mrs Holman, and herds everyone else (except Sharon, natch) down to a workroom where his girlfriend Lisette is carefully laying out tools by the sculpture. Steven is brought back to join the party, and Dengler tortures and kills him for his mock heroism. It turns out that the base of the sculpture houses some kind of leftover Nazi nerve gas spheres, the real reason Dengler had the work of art imported in the first place. 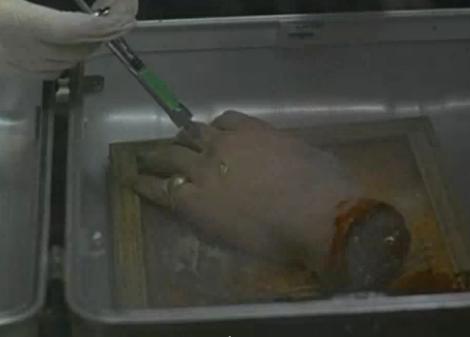 After a James Bond Villain-esque soliloquy detailing his plans for selling the biological weapon to the highest bidder, Dengler gives a demonstration of the gas which boils and bubbles away on Steven's severed hand. With the passcard in tow, Sharon sees the hostage-taking on a security monitor, allowing her to sneak to the workroom and overhear the evil plans. Outraged, she starts blindly shooting at everyone with one of the security guard's guns. In the confusion, Reggie accidently sets off one of the spheres in a sealed-off storage room, leading to a much more graphic display of the melting flesh. Sharon splits off from the group again, and proceeds to take out Dengler's henchmen and the corrupt guards one by one. First up is Lisette, who Sharon drop kicks onto some particularly pointy art. Then we're treated to a flurry of scenes almost identical to those in the first film: People climbing through air ducts. Sharon running around furnace rooms with a walkie-talkie. Bad guys left for dead suddenly back for another round of punishment. More people climbing through air ducts. 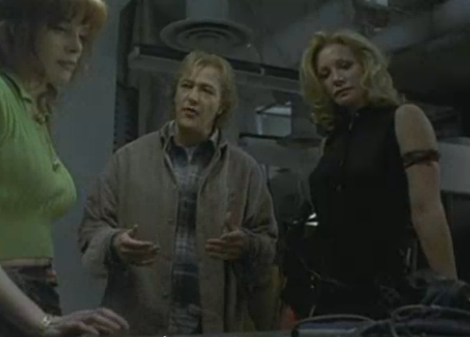 Soon it's down to just Sharon and Bobbi on one side, and Dengler, with Jack as his hostage, on the other. Dengler wants to trade Jack's life for the passcard, and drops a nerve gas sphere in the air ducts to expedite the bargaining process. The most ridiculous part of No Contest II? Probably a tie between when Bobbi and director Jack get MacGyver-creative with tin cans and a dart set, and the scene when Bobbi blames Sharon for standing by when she was abused as a child which serves to set up their tearful reconciliation. Most expected plot twist? 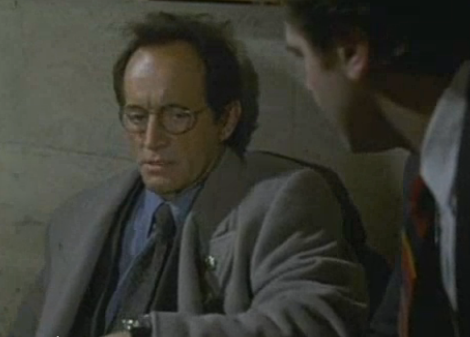 Even though he seems like a good guy art buff at the beginning, slimy character actor Lance Henriksen turns out to be a villain! But probably the weirdest thing about No Contest II is one casting choice in particular--Toronto gay playright/personality Sky Gilbert appears as Beagle, Dengler's tough machine-gun toting sidekick. Although he certainly looks the part, it's a far cry from Gilbert's real-life persona, and Lynch completes the illusion by having him shout what few lines of dialogue he has. Lynch has made two films in this series now, but which is the better No Contest film is definitely contestable. Surprisingly, No Contest II eschews much of the campiness that lightened up the first installment, trading it for a slightly darker tone. The first film has a silly plot more structured around the scantily clad beauty pageant contestants than the evil villains. 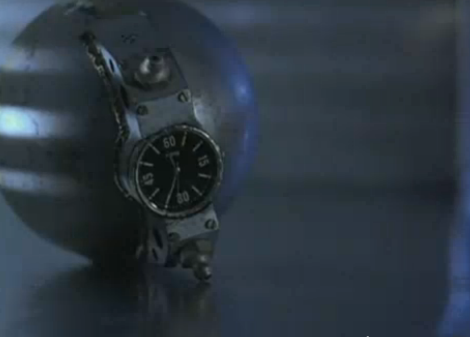 Fittingly, it is grandiose and tongue-in-cheek, with lots of explosions and a large cast. Here, the Nazi gas plot is much more believable and logical-- almost boringly conventional. The cast is considerably smaller, the sets more claustrophobic, and the action much more to the point. As a result, the original No Contest is much more enjoyable to watch. One has to wonder if the character of Steven, Sharon's temperamental co-star, is really a stand-in for Miss November 1981 herself. During the torture scene, Dengler makes the hapless actor spout Shakespeare at gunpoint before repeatedly shooting him for not doing it to his liking. Jack half-heartedly defends Steven's lack of skills by explaining, " He's not an actor, he's a star." One has to wonder if these comments, as well as the painful death bestowed upon Steven, wasn't a case of emotional transference on the production team's part.